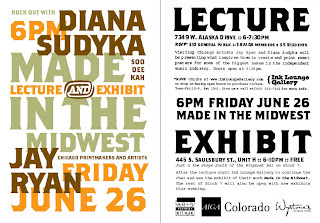 Exhibit and Lecture - Ink Lounge Gallery, Colorado. I'm flying off to Colorado tomorrow for this show. Should be a lot of fun, except for the part where I actually have to talk about my work! Check out the Ink Lounge Gallery. Have a blast! You will do great and they will love your work!! I'm sure they will be knocked out by your work Diana, so the talking will be easy. Wish I could see you do something like that, maybe they'll be an event in or or near Toronto one day.